Professionals Plus Realty, Inc. of Tifton, Georgia, was created to bring a higher level of customer service to the profession. That’s why it requires its agents to complete Graduate Realtor Institute (GRI) certification and that’s why it turned to StrandVision when it wanted a better way to present its listings to visitors to its office. As a result, when Professionals Plus Realty unveiled its new office, it also debuted a 48” flat screen digital sign driven by StrandVision. Now, visitors have a whole new outlook when they stop by. Professionals Plus Realty, Inc. of Tifton, Georgia is, as its name implies, a group of 22 experienced, GRI-certified realty professionals who are intent on raising the bar on customer service. The professionalism extends to their office. Early in 2008 Professionals Plus Realty moved into a new office. Advertising Manager Alice Johnson saw it as an opportunity to leave behind some of the outdated trappings of typical realty offices, starting with "the tacky picture board of house listings that are in most realty offices." 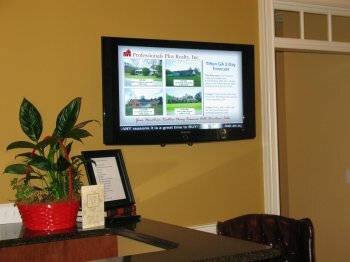 After researching options, including very expensive touch-screen systems, and seeing what some other progressive realtors were doing, Alice decided on a digital signage system from StrandVision using a wall-mounted 48" flat screen display in the lobby. The digital sign complements Professionals Plus Realty's other major promotional efforts - their Website (www.proplusrealty.com), Realtor.com and their printed realty showcase. She explained, "The digital sign advertises all of our listings in a professional way that looks good and catches the eye. It also saved us a lot of money compared to other systems." The pre-construction digital signage decision allowed Professionals Plus Realty to have the electrical and network wiring installed before the walls were closed. The lobby display is driven by a computer located in their computer room a few feet away. It also gave Alice three months to design and develop the digital signage pages. She started with online demonstrations and training from Amy Hansen at StrandVision and then picked up the rest on her own. She was able to preview the pages on her computer well before the digital signage display was installed. "I was able to preview everything on StrandVision, so I had a pretty good idea of what it would look like on the big screen." The screen is divided into two frames with the 1/3 frame showing news and weather, sponsored advertising and features on agents of the month, etc. The 2/3 frame has information on Professionals Plus Realty and the listings. Each listing page presents four properties in different price ranges. Explained Alice, "We want houses in every price range on the page so there's something of interest to everyone every time the slide flips." Alice creates the slides on her office computer using an application called LivePix SOHO. She designs each layout and then saves it as a JPG file on the StrandVision server. She updates the slides about once a week, removing properties that have sold and adding new listings. Alice is pleased with the StrandVision digital sign. "The easiest thing about it is that it's all Web-based. I just create the JPGs and save them to StrandVision. Also, the cost is very reasonable compared to the other options out there."